Cupcakes 'n Daisies: An Early Christmas Present . . . . .
An Early Christmas Present . . . . .
On the eve of Christmas Eve, I got a call from my long arm quilter, Dawn at the Sewing Basket, she had a quilt all done and ready to come home, Sassy Toulouse!! 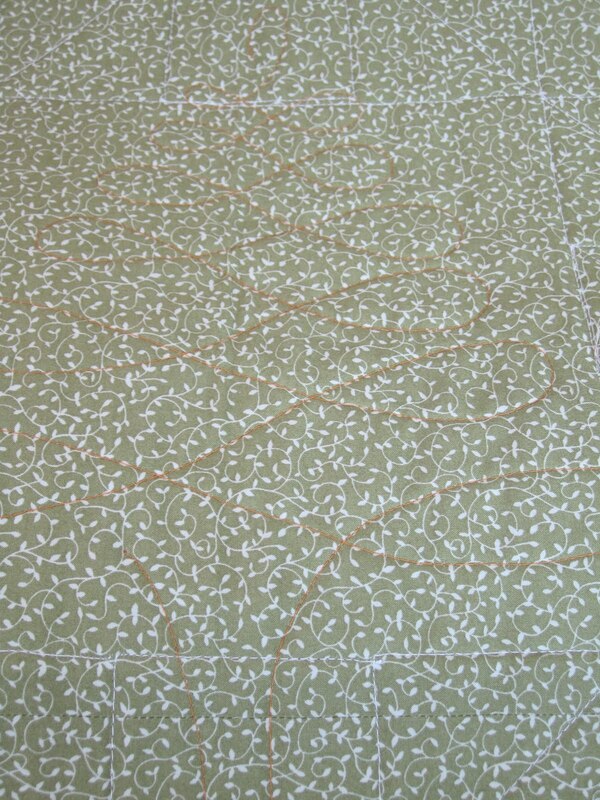 The pattern is Toulouse by Miss Rosie's Quilt Company and the fabric is Maison de Noel by 3 Sisters for Moda. I finished this quilt back in February, it sure was a wonderful addition to my holiday weekend fun to be able to enjoy this quilt. Christmas Eve I was snuggled under this quilt on the red couch watching it snow. What a perfect way to break in a Christmas quilt! This project was a sew along with Nicole/Sister's Choice and Lisa/Stashmaster. Nicole named us "Les Triplettes de Toulouse". After working on this project for a couple of weeks, the red and cream background fabric started to overwhelm me, but once the top was all pieced, I warmed up to it and thought it gave the quilt a sassy Christmassy feel. Well the background is still red, but absence has made the heart grow fonder, I really like it, the quilt shouts Christmas. I love this pattern and the fabric is one of my most favorites, it will be hard to only have this quilt out on my red couch the month of December. The pattern went together so easily, I'm considering making another one, I think it would look good in Bliss, or some Fig Tree or Kansas Troubles fabric.....well, really, any fabric would look great with this pattern! The quilting is a custom job, a nice amount of quilting in the center blocks, borders and flying geese. 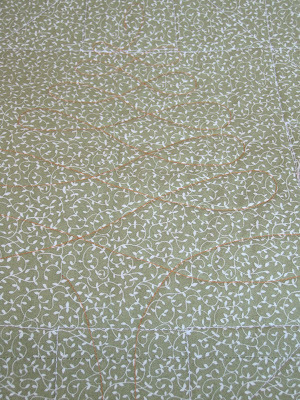 Running down the center of each Goose in the Pond block is a loopy Christmas Tree pattern in gold thread. It's very subtle, and really hard to pick out in this picture, but I think it was a clever addition, a little Christmas surprise. Sassy Toulouse finished at 75 X 75, has approximately 1561 pieces, and is Lifetime Quilt #55. To read more about this project, select Quilt #55 from my Lifetime Quilt list on the right. Definitely an extra treat to get a Xmas quilt back just in time for Christmas! Funny thing, I just bought this pattern. I had seen the sew along you and the gals had earlier this year and put the pattern in my TBB (to be bought) list. I picked it up last week. It arrived about two days ago. I'm still deciding what fabric to use but I'm not in a rush. I can always peek back to your posts for inspiration! Happy New Year! It turned out great, Thelma! That fabric is fabulous! Congrats on a gorgeous #55! I love every single thing about this quilt...it's just gorgeous!!! 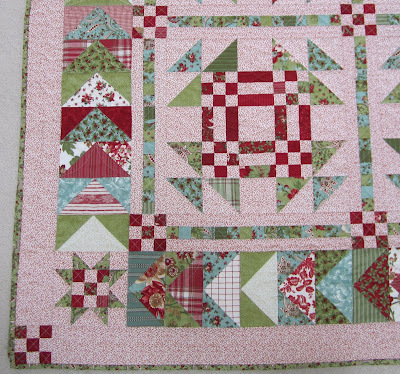 This is a very cheerful Christmas quilt! Gorgeous! I love it! It has a perfect Christmasy feel to it! Really...the background fabric is wonderful...a plain neutral would not do!!! I liked it when you showed it before sending it to the quilters, and it's fun to see it again - still looking great. I remember the quilt along! It's beautiful, Thelma. Its just beautiful Thelma! 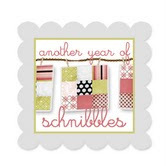 I remember when you were all quilting along~ such fun! Happy New Year! I love it! also I love that you included the number of pieces. That quilt is gorgeous! It's been on my "to do" for a long time. 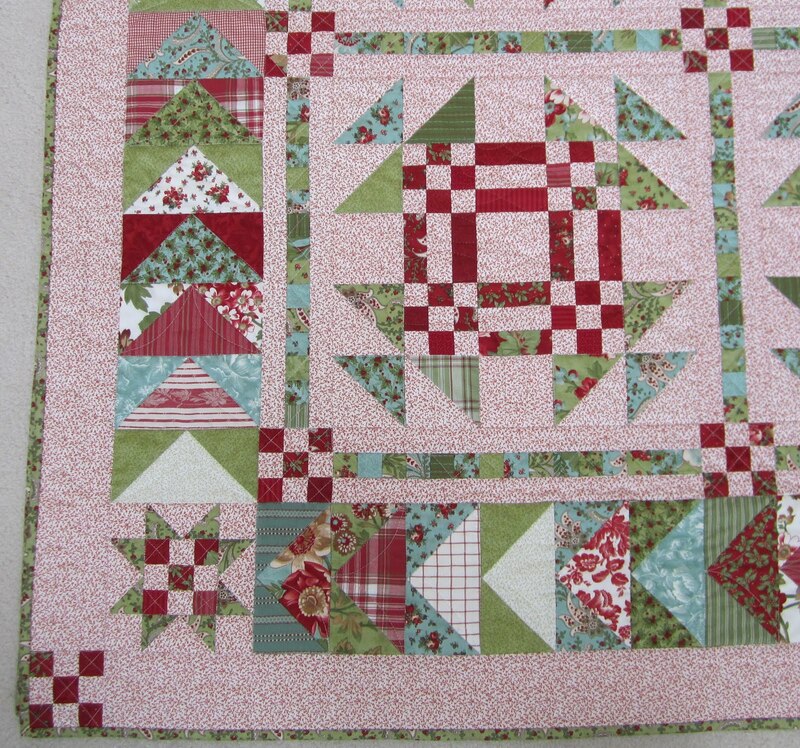 Lovely quilt...I love the loopy tree quilt design too...thanks for sharing it. It's beautiful and so cheery and festive. Christmas 2011 will be here before we all know it and then it can shine on your sofa once again. I think the quilt looks great! Love the festive colors! Looks great on your red couch! Oh I just LOVE that quilt! 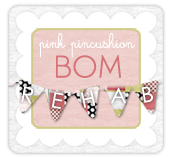 That fabric line was one of my all time favorites! Your quilt is gorgeous! I know it's taxing to work with a very controlled pallette (?) but the finished product is just beautiful! I think the colors are just beautiful. I am not sure I would be able to put it away! I just love it!!! I love the quilt, and I have most of a fat quarter pack of those fabrics in my stash. After seeing your quilt I may just cut into them. this quilt is just beautiful. she did a nice job with the quilting too. I love this quilt! So fun to see it all done. I've been looking for a fun quilt to do out of Bliss, I just might have to take your suggestion! Happy New Year, Thelma! Thanks for help making 2010 so special for me! i'm with Ranette - there isn't anything i don't love about your quilt!!! One of the prettiest quilts I've ever seen. Let It Snow . . . .
Fahoo Fores, Dahoo Dores . .
Red, White and Wonderful . . . It's the Eve of the Eve of Christmas Eve!!! A Weekend of Family Christmas Fun . . . He Knows When You Are Sleeping . . . . . . . .
A Little Bit of a Whole Lotta . . . . .
Oh Christmas Tree . . . .
Not Quite There . . . . Lesson Learned . . . .
Three Updates . . . . Finally Off that Mocha Trail . . . .
Another Quilt Is Home . . . .